This thesis focuses on the task of dexterous manipulation of deformable objects, and in particular, clothing and garments. The task of manipulating deformable objects such as clothing can be broken down into a series of sub-tasks: (1) perceive and pick up garment, and then identify garment and recognize its pose; (2) using a manipulation strategy, regrasp the object to put it into a canonical state; (3) scan the surface of the object to find wrinkles, and use an iron to remove the wrinkles; (4) starting from the wrinkle-free state, fold the garment according to pre-planned sequence of manipulations with optimized trajectories; In this thesis, we will address all the phases of this process. A key contribution of the work is innovative use of simulation. 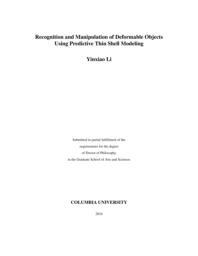 We use offline simulation results to predict states of deformable objects (i.e. cloth, fabric, clothing) that are then recognized by a robotic vision/grasping system to correctly pick up and manipulate these objects. The recognition will use the simulation engine to deform the models in real time to find correct matches. The simulation will also be used to find the optimized trajectories for the manipulation of the garments, such as the garment folding.